We are so proud to have been involved with Carnival 56. This is year one of a new festival that many hope (including myself) will be an ongoing event in Camperdown Park, Dundee. The organisers and team deserve a huge congratulations for putting on an amazing event and I’m sure it was an incredible platform to build on for the future! Personally, I had such a great time at the event and sincerely hope there are many more to come! 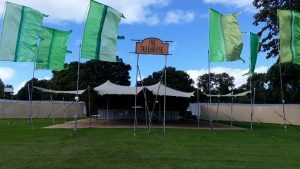 The Altered State were asked to produce signs for two areas, The Treehouse stage and the Secret Garden VIP area. Being asked to make signs was a tiny part in the overall event but a huge opportunity for me / my company and I was thrilled to see them in position on the day. Utilising CNC technology, laser cutting, laser engraving and wood working, we constructed the 2M wide signs at our workshop in Carnoustie. 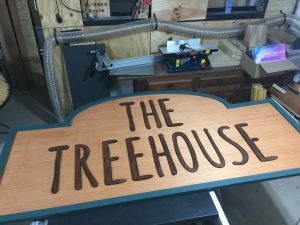 The sign for The Treehouse stage was the simpler of the two. The body of the sign is constructed from marine plywood treated with Danish oil. 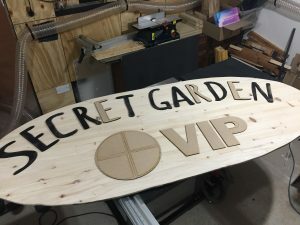 The arch was hand cut following a template cut on the laser. The border is strips of plywood cut, shaped and painted green to form a frame around the lettering. The lettering was laser cut MDF which was stained to add to the wood look. 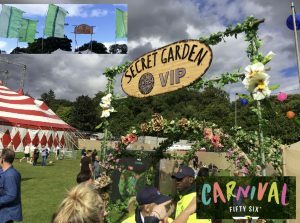 Jaggi Gin’s VIP Secret Garden was a VIP area within the festival so the sign needed to be something special. 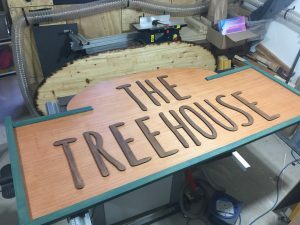 Using OSB wood as a base, the sign was constructed in 2 pieces. 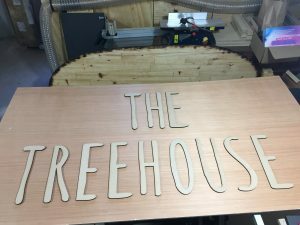 The sign needed to be 2M wide but to get an accurate oval shape we wanted to use the CNC. We have an X-Carve CNC from Inventables but the bed size only allows cuts of around 800mm. So we cut the semi circles at the maximum the CNC would allow and ripped a centre joining line to allow assembly to bring the base to the required size. 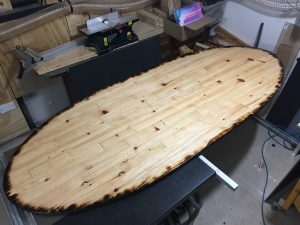 The top surface is covered in 5mm strips of reclaimed fence post ripped to size on the table saw and then glued and nailed to the OSB substrate before having the perimeter edges burned with a blow torch and the whole surface being covered in Danish oil. We laser cut the Secret Garden letters from 6mm MDF first and fitted those to the sign and to make the letters nice and visible we finished them with laser cut 3mm gloss black acrylic. 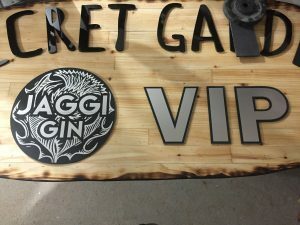 The Jaggi Gin logo and VIP letters were also first laser cut from MDF before being finished with a brushed stainless steel and black laser plastic which we also engraved.